Acrylic on board in antique gilt frame. I was inspired to paint this by the scene in 'Titanic' where the character, Rose strips off to be drawn by true character, Jack. As well as being a lighthearted poke at the ridiculousness of the scene the painting also refers too the many roles women have to adopt and how we have been historically represented in paintings. I decided to portray a mix of the roles we have to play in order to challenge the viewer to categorise both myself and the painting. I also intended to challenge the concept of the 'Male Gaze' by adopting a clearly sexualised pose whilst wearing rubber gloves and a frilly apron. 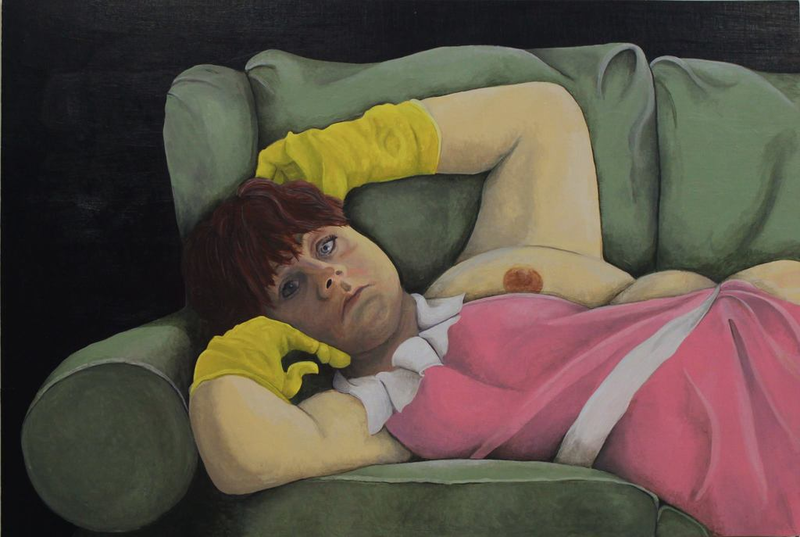 The aim of this was to challenge the viewer to 'gaze' at an ordinary woman in her entirety.